Green Glue Compound does have a slight smell, but it is less noticeable than paint and begins to fade within a couple hours. 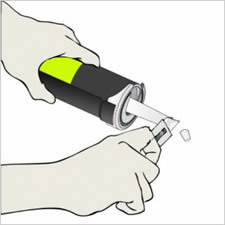 While Green Caulking Glue Compound is sticky, it is not an adhesive and should never be used without fasteners. Green Glue Compound can be washed off your hands, tools, or other objects using soap and water. Pumice soap is recommended. Responsible application will lead to no mess. Green Glue Compound is thick enough to not run off the drywall. No specific coverage pattern is necessary to ensure excellent results. Apply at least semi-evenly for successful application. 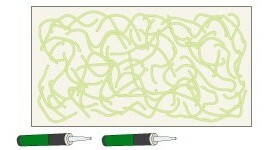 A larger opening on the nozzle will speed up application without affecting the performance of the Green Glue Compound. Cut the plastic bubble from the end of the tube with a razor. Attach the nozzle to the tube. 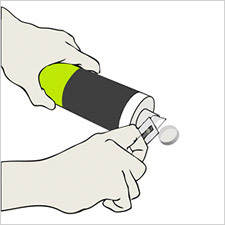 Friendly Caulking Tube Tips: Each case of Green Glue Compound will come with 12 nozzles. 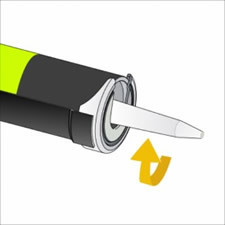 To speed up application and save about an ounce of Green Glue Compound per tube you should use the same nozzle for each tube. Cut the end of the nozzle creating a roughly 3/8″ wide opening. No increase in low frequency isolation. Decent gains in mid to high frequencies. Consistent gains from low to high frequencies. No increase in mid to high frequencies. 50% gain in low frequencies. 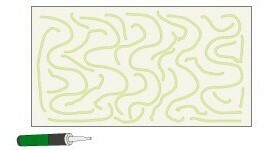 With your drywall on the floor or leaning against a wall, apply the Compound from your caulking gun in a random pattern. Be sure to leave a 2″ perimeter so you can hold the drywall while lifting it into place. Once the Compound is applied, lift it into place against the wall or ceiling. It is important to accurately mount each panel the first time without sliding it around. 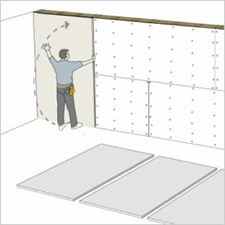 Drill each sheet of drywall into place entirely before installing the next sheet. 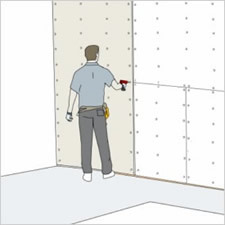 The second layer of drywall should be fully attached to the studs with the same screw pattern as the first layer. Offset the seams of the second layer from the first layer to avoid having to seal the first layer with caulk. 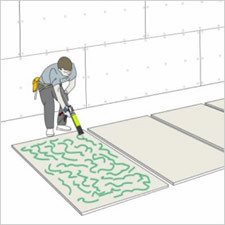 Once the topmost layer of drywall is attached, seal thoroughly using Green Glue Sealant or a comparable caulk. Tape and mud your seams as you would normally and prepare for your wall finishing. There is no correct pattern to follow when applying Green Glue Compound. Consistency in ounces per square foot is the only requirement. You can use any thickness of drywall with Green Glue Compound. The more mass, the better the performance in low frequencies. Leave a 2″ border along the drywall perimeter for easier handling and room for the Green Glue Compound to spread on compression. 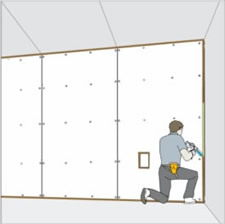 Sealing the wall is crucial to the performance of any sound assembly. Unsealed gaps can transfer significant amounts of sound. The first layer of drywall should be attached using 1-1/4″ drywall screws and the second layer with 1-5/8″ or 1-7/8″ drywall screws. Green Glue Compound must compress between layers to work properly. Completely fasten each sheet within 15 minutes of application.